Manufactured in France from 1946 until 1955. 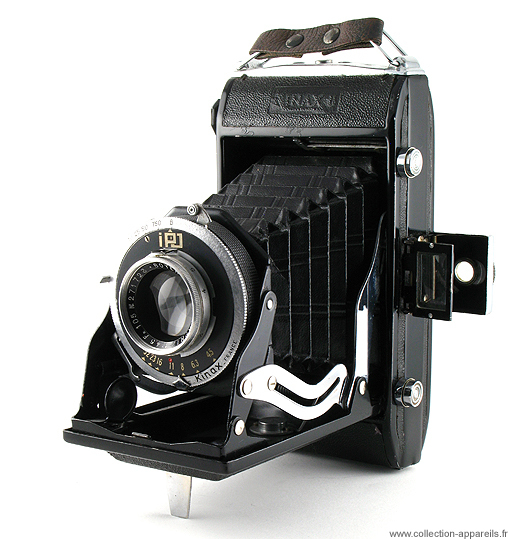 This 6 X 9 (620) has a lens 4,5/105 mm. The shutter is a IPO, which is neither more nor less than the new name of Etablissements Jousset after the WWII: société Industrielle de Photographie et d'Optique. In its “Histoire des appareils Français”, B. Vial indicates that these shutters were home-made manufactured in Doubs and the Jura (then area of the clock industry in France). In July 2002, I carried out some research around Morteau on the manufacture of these shutters, without success. On the side of the body are two identical buttons . That in top makes it possible to open the flap and to deploy the bellows. This aperture is accompanied by the unfolding of the finder. That of bottom is a shutter release (there is sometimes one on the shutter). When the camera is used in horizontal format, the shutter release of the body is thus found under the left hand. Of each side of the body is an enamelled band which gives a luxury touch to the camera. The latest cameras have flasks chrome in the prolongation of the axes of the reels. The finder is equipped with a corrector of parallax, i.e. a setting of the distance from focusing. On the first models of finder, this correction is possible while making turn a lens. On the following finders, there is also modification of the angle of the finder according to the distance from focusing (this finder should not be confused with Kolinax, which is collimated , from where its name). There are also color variants of certain models of Kinax. It seems that these variants were available only to export. On the cameras below, except for that with Saphir lens, the distance scale is graduated up to 50. Saphir is graduated up to 15. We note a marking with 50 on the foreign variants, for which, it is added “feet”. 50 feet correspond to approximately 15 meters. This coincidence disturbs me.